Most aviators want to be the best they can be. We all want to be Maverick in Top Gun, ruling the skies and greasing on every landing. Whether we fly a 747 or a Piper Cherokee, when we get in that airplane and flip on the switches, we are pilot-in-command. The world awaits. But once we’ve mastered our airplane and the type of flying we do, things can seem easy, almost routine. One might think this is a good thing, but in aviation, ironically, it isn’t. The more we stay in our comfort zone and the less we push our envelope, the more at risk we are to become overconfident and complacent, and that’s not a good place for Maverick to be. It’s human nature that we need to push ourselves to stay challenged, and to stay humbled. There’s risk in taking on something new or something you don’t like. It can be intimidating. For example, I don’t like public speaking. My dread and fear of it has been the hardest thing I’ve ever had to overcome, and it still creates a lot of anxiety. But there are times when I can’t turn down a request because of the great opportunity associated with it—perhaps reaching out to young women or speaking about something that I’m passionate about. I have to push myself to accept speaking opportunities and not avoid them, knowing it can be rewarding and worth it. Risk can be defined as exposing yourself to danger, but I prefer to think of it as opportunity. Don’t get me wrong—I would never advocate being reckless or stupid—but we have to push ourselves. Some of us are naturally more risk takers than others but certainly there’s also an element of risk in anything we do, especially when we step out of our comfort zone. We ask ourselves: Will I be good at this? What if I fail? What if I hate it? What will I do with what I learn later? It can be a lot easier to stay in your comfort zone where you know what the outcome is. In any form of self-improvement, we either have to learn something new or identify things we’re not as good at, or dislike, and work on them. Finding new opportunities in aviation isn’t hard to do—get a new rating, learn to fly a new airplane. Identifying what we aren’t good at might be harder for Maverick because he already knows he’s good, but sometimes it’s the things that are hardest for us that turn out to be the best teachers. I’ve discussed with other CFIs how pilots are sometimes reluctant to get additional training. What we see with upset training is that even though pilots know they need it, they tend to avoid it because they don’t know if they’ll like it. It’s a risk for them to take that step. Maybe it’s human nature that the better we become at something, the more we enjoy the comfort level we’ve achieved, the less apt we are to step outside of it. But we all know, when you take on something new, you almost always wind up feeling inspired. A good way to energize your flying is to get a new rating. You can upgrade to an instrument ticket, which is perhaps the most bang for your safety buck. And for those with more exotic interests, how about a type rating in an antique, like a DC-3? There are all kinds of opportunities for all of us pilots to add to our repertoire. A seaplane rating is an awesome way to stay energized. 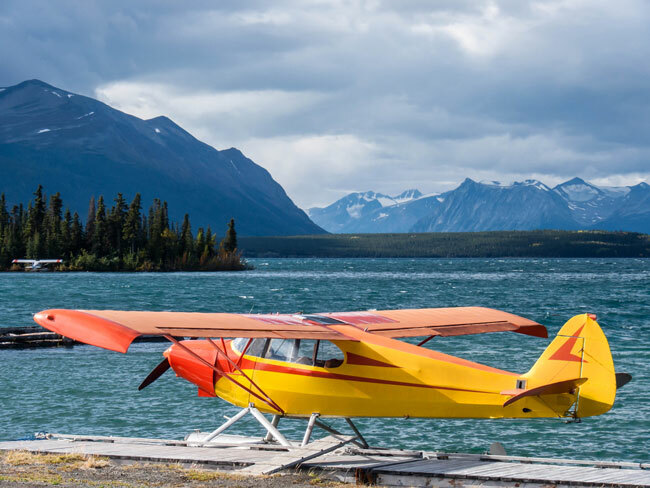 I’ve heard people say, “Why should I get a seaplane rating? I’ll probably never have the chance to fly one again.” But it will surprise you how much you’ll learn about airplane control and landing techniques. Not to mention “ASES”—Airplane, Single Engine Sea—looks pretty cool on your pilot’s certificate. Some pilots try to avoid crosswind landings. You can’t avoid them forever because, if you do, the usefulness of your pilot’s license will be really limited. If you’re only comfortable with a 10- to 12-knot crosswind, go practice in those conditions until you can stay on the centerline and you feel your technique is solid. Then, hire a good instructor to help you work on landing in stronger crosswinds until you’re comfortable. Then start the process again with practice. You can do it. Cross-country flying is one of my favorite things to do, but some pilots I know, even airshow pilots, surprisingly don’t like it. Maybe they didn’t have very good instruction, have scared themselves or just don’t like talking on the radio. If long trips aren’t for you, ask yourself why and then remember that a long cross-country is just a series of short ones, airport to airport. A good way to gain cross-country experience is to hire a CFI to fly with you on long trips, but sooner or later you know what you have to do—start planning and pack your bags. There are lots of ways to get outside your personal envelope in aviation by trying something new—airplane type ratings, seaplane rating, advanced air and ground ratings, even flying more often by volunteering for Angel Flight or Pilots N Paws. They will all help you expand your repertoire, keep you challenged and help you remember why you learned to fly in the first place. There’s more risk in not pushing your envelope. If you don’t find ways to push yourself, you’ll feel stale, frustrated. Woody Allen said, “I don’t respond well to mellow...if I get too mellow, I ripen and then rot.” On the other hand, the benefits of achieving something new, changing your outlook and improving your skills not only will make you a better pilot, it will give you a deeper sense of satisfaction. A comfort zone is defined as “…a psychological state in which things feel familiar to a person and they are at ease and in control of their environment… In this zone, a steady level of performance is possible.” It’s also described as an “anxiety-neutral position” and “where we feel we have some control.” As a pilot, it might seem safer and more competent to stay in this zone, where we “feel we have some control,” but putting yourself in new situations on a regular basis is more than just self-improvement. It has real benefit and actually makes you more safe and in control. According to a description of Performance Management, “Stepping out of a comfort zone raises anxiety and generates a stress response. This results in an enhanced level of concentration and focus.” The enhanced level of concentration and focus is what I’m looking for in my flying. I’ll never get it just right, but I know there are always ways to improve.